WEARS SWIM SUIT BEST Beverly Michaels, Billy Rose Diamond Horseshoe showgirl, was chosen as the 1946 Night Club Swim for Health Week girl for superior ability in displaying a bathing suit. What won't they think up next. The Marine Adder, arriving at King George docks in Calcutta this week, will begin loading its advance party from Dum Dum at 0500, May 3, a Base Section Transportation spokesman said yesterday. The complete voyage will take approximately 33 days to arrive in San Francisco after stopping at Shanghai. At approximately 0730 Friday, the first convoy from Camp Tollygunge will board the Adder, completing the loading of U.S.-bound men at 0830. The six officers and 439 enlisted men bound for the China Theater for reassignment will load at 0945, with men from the 442nd Replacement Co., supernumeraries from Replacement Depot No. 3, and 124 fare-paying China-bound civilians rounding out the shipment. The Adder is scheduled to depart from King George docks at 1230 May 3 with 120 officers, 1,763 enlisted men Stateside-bound, six officers and 439 EM for duty in China, and 124 civilians, totaling 2,452 passengers for the Adder. The Marine Panther, also scheduled to arrive here this week, will depart for the U.S. on May 6. Unit commanders within the Theater have been directed to release every man they can spare for the Panther, a Theater spokesman stated. The Panther will fill up her spare compartments at Manila before docking in San Francisco, also taking about 33 days for the complete trip. The Marine Jumper, the vessel scheduled to be the final troopship from the India-Burma Theater, is expected to dock in Calcutta May 25, and depart for San Francisco during the day of May 31, the spokesman said. The Jumper will carry the remaining troops left after the Adder and Panther depart, with the exception of the residual team to remain on after the closing of the Theater. CALCUTTA - Inactivation of Headquarters, U.S. Army Air Forces, India-Burma Theater, was announced this week by Maj. Gen. Vernon Evans, Theater Commander. 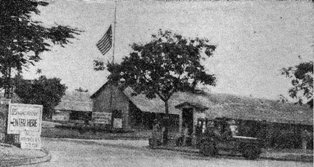 Headquarters, U.S. Army Air Forces, India-Burma Theater, was organized in August, 1943. The first commander was Lt. Gen. George E. Stratemeyer, now China Theater AAF commander. For a time the operation of this Headquarters was under the overall command of Gen. Joseph W. Stilwell. Later, when Admiral Lord Louis Mountbatten became Supreme Allied Commander, South East Asia Command, all Allied combat air forces in South East Asia were integrated into Eastern Air Command with Stratemeyer as Air Commander. Under this command combat air units of both the RAF and the AAF carried the war to the Japanese in Burma. Fighter planes of the 10th Air Force patrolled the "Hump" route, protecting the cargo planes that carried supplies to China. Heavy bombers struck at Rangoon and Bangkok and patrolled the Martaban Gulf, while medium bombardment aircraft harassed Japanese lines of communications. 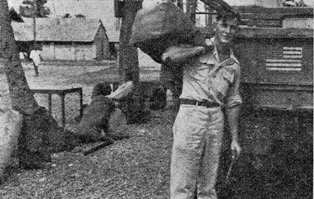 The First Air Commando Group, under Col. Phillip G. Cochran, carried Maj. Gen. Orde C. Wingate's Chindits into landing strips 150 miles behind the Japanese lines. When the China-Burma-India Theater was split into China Theater and India-Burma Theater Stratemeyer became Commanding General, AAF, China Theater, and Maj. Gen. Thomas J. Hanley, Jr. assumed command of U.S. Army Air Forces in the India-Burma Theater. Brig. Gen. Thomas B. McDonald is the final AAF commander. For Sgt. Millard Hinton and a group of casuals it was a beautiful day. But for the rest of Calcutta it was somewhat dismal. The skies overhead were dark and it threatened rain most of the time. Your reporter visited Replacement Depot Number 3 at the 142nd Hospital area on that dismal day, as a "snooper" and not a casual. The replacement depot is another one of those "run of the mill" Army affairs with cards to fill out, lines to sweat, clothing issues, dental surveys, shots to get, partial pays and a million and one other things. To Hinton it meant the beginning of a long trip home; to the men of the depot it was just another day. Sgt. Hinton hails from Howard, Pa. He is a quiet fellow and takes everything in his stride. He entered the Army in June, 1944, and took his basic training at Camp Blanding, Fla. He arrived for duty in the India-Burma Theater last August. Hinton arrived at the depot early in the morning and began his processing by paying a visit to Ward 32, the Receiving and Registration office. This building is open day and night to receive any and all men that might arrive at the depot for processing. Under the eyes of lt. Davis, the casuals are sent through a five station affair. Station 1 is operated by Sgt. Frank Wojcik, Sgt. Ray Young and Cpl. John Rolka. At that point the men fill out three cards; a billeting card, a morning report and locater card, and a change of address card. From station 1, the troops move down to station 2, where a casual on duty takes the morning report and change of address card from the men. At station 3, the men fill out a certificate stating that they have no live ammunition on their person. Cpl. John Goodman runs station 4. He sees that the troops turn in their old PX ration cards and obtain a new one. Cpl. Donald Day and Cpl. Truman May, under the supervision of S/Sgt. Larry Coffay, check the cards at station 5. Also in the same ward, Sgt. 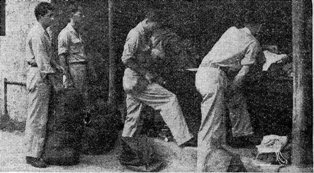 George Exarhakos and a group of civilian workers cut the attachment orders for the casuals arriving at the depot for processing. From Ward 32, Hinton moved to the Clothing Check and Issuing building. The men turn in their old uniforms and get new ones for the trip home. Due to the shortage of trained personnel, civilians issue the clothing. At one time during the process Sgt. Hinton said "I'll take any size, large or small, as long as I can get into it." The last ward is the records processing building. Here the men are given a dental check, shots and a partial pay. The processing is now finished, the time for waiting begins. Sgt. Frank Bukowski is in charge of transportation for the casuals. Men who live in the northeastern section of the U.S. are sent to Camp Dum Dum for billeting purposes. Troops who hail from the midwest, the south, and the southwest and parts of the far west are sent to Camp Tollygunge. The rest, namely men from California and Illinois, are sent to the 442nd Replacement Company which is located on the hospital grounds. Of the original cards that the casuals fill out, one of them ends up at Outbound Statistics. At Outbound the cards are filed away to be "pulled" at a later date for a ship. Lt. Fred Stivers, Jr. is the officer in charge of Outbound. S/Sgt. William Lendeman is the NCO in charge. At its full peak of strength the statistics section had 30 enlisted men and officers. They are now doing the same job with eight enlisted men and one officer, with the help of 12 civilian workers, nine of whom are women. The cards are "pulled" for a ship by Sgt. Horace B. Long and sent to Sgt. Bill Lindenmuth. "Lindy" and "his women" cut the orders. Just in case you are curious, of the nine women that work there, five are married and four are engaged. According to Sgt. Wayne Waganer, chief statistician for the section, 36 troopships have left Calcutta since August 31 of last year. Approximately 115,000 men, including patients and prisoners, have been returned to the States from the Replacement Depot. 2,700 have gone via the skies. The men who have been processed now have to "sweat out a boat." The I and E Special Service Office of the depot has seen to it that the troops are provided with ample recreational facilities. Movies, games, books and the like are available at each of the transient camps. A news bulletin is published daily to keep the men informed as to world doings. Capt. N. J. Young, Jr. and Lt. W. W. Wilson, along with their staff, see that the men do not get "casualitis." In an interview with Lt. Col. Carl Deuter, it was learned that Camps Dum Dum and Tollygunge are tentatively scheduled to shut down after the departure of the second ship in May. When asked why no definite closing date could be set, Col. Deuter said it was all up to the Hooghly River. He explained that the varying tides of the river are the main factor in the arriving dates, the loading dates, and the departure dates of the troopships. "That is why we have to have a 'blitzkrieg' loading when the boats do arrive," he said. When the men come "out on orders," they are immediately restricted to their camp area. The reason for this is to keep them out of as much "trouble" as possible. If they are needed for anything, such as the last minute physical checkup, they can be found without any delay. Then the lucky ones are loaded on trucks and head for the docks and home. The closing of the I-B Theater will not curtail mail service to and from the U.S., Maj. A. L. Guilfoyle, Theater Postal Officer, stated this week in clarifying the mail situation. "At the present moment," Guilfoyle said, "we have three planes leaving Calcutta weekly for the States. These include two Pan-American airliners and one Globemaster. They will continue to make their weekly runs until July 1. After that date, only the Globemaster will carry mail from India." Guilfoyle said, "We have been allotted 1,900 pounds of parcel post mail a week. Some of it does leave via air; the rest is sent on ships. All letters are sent Stateside by air." A residual team will be left behind to continue the postal work, Guilfoyle added. It will include some civilian workers, and will take care of all incoming and outgoing mail after June 1. CALCUTTA'S FRENCH TOWN Here's the "main drag" of Calcutta's ghost city. Chandernagore, formerly a separate French territory. Collier tells of the effect GI's from Camp Angus had upon the desolated town during the war. CHANDERNAGORE - White sign on an open gate says "Far Eastern Transit Depot" but the silence gives it the lie. The silence is like the heat: it hangs heavily on the air, like bunting on a windless day, and as far as you can see there are only the long battalions of empty huts, raw weeds sprouting among the cinders. This is a ghost city, the ghost of the once mighty Camp Angus trooping depot, the last port of call for thousands of Statesbound GI's. Here they took their last look at the East and gave their verdict. It was maybe a fitting enough place to deliver it. Chandernagore, twenty miles from Calcutta along the sludgy mud-flats of the Hooghly, is a ghost city, too. Chandernagore, which translates to mean "City of Sandalwood," is one of La France's stakes in India, a stake which pays no dividends and lingers on for sentimental reasons only. Its story lies in its past and in the tale of its dissolution into the ugly Bengali landscape that hems it in. Way back in the mists of time - 1731, for the book - this was a city of 103,000 Frenchmen, the heart of Bengal's cloth-weaving industry, with 2,000 brick-built European houses set down here in the meadows by the Grand Trunk Road. Under the dynamic French Governor Dupleix and the old French East India Company, its trade hit a high unknown to the British merchants in Calcutta, with ships already journeying as far east as China. The British sat and licked their chops and waited. Their chance came with Europe's Seven Years War in 1757. In the Eastern zone the powers had agreed to remain neutral, but the gyp was on. The movie relating the dash and derring-do of Clive of India omitted the story of how he broke the treaty, marched against Chandernagore and burned it to the ground. When the terrain was restored to the French in 1810 - a charred jumble of bricks - it was too late. There was no longer any French. They had all gone away. It took World War II and the founding of Angus to pump back life blood. This was a curio town, a tattered remnant of the tri-color resting on tradition. There were only four Frenchmen here then: the Governor, the Police Commissioner, a saloon keeper and the oldest inhabitant. But the postage stamps were French, the road signs were French, even the liquor, brewed in Pondicherry, had something French to it, a subtle kick like a mule's hoof. You were on French territory here and if you were a wanted man, it needed orders to get you out again. The GI's went to town and the saloon rose to meet the occasion. At weekends, jeeps and trucks swung recurrent clouds of blinding dust across Chandernagore's Place Dupleix, as GI's and their floozies arrived to rubberneck the Convent, the Church of Jeanne d'Arc, the old whitewashed tower of the Commissaire on the riverside. They threw farewell parties: the States were in sight at last and every night was New Year's Eve. A town that had been dead for six score years was suddenly reborn. Now Angus is dead, closed several months past; there are other depots to replace it. But not at Chandernagore. The keynote here is gloom. Lamented the deacon of saloon chiefs, the White Hart's 47-year-old Paul Pierre de Closets: "I can remember the nights when thousand rupee notes changed hands on this very bar here. Now it's all finished. I'm getting out, selling up. It isn't worth my while to stay here. It wouldn't be worth yours." You look out of the window and follow his gaze as he speaks. "Auberge" (Inn) read the signs, "Poste et Telegraphie." The water glints like a silver mirror and the sky is as blue as a robin's egg. It is noon. Down the long winding stretch of Main Street comes a single bullock cart, ambling somnolently past in the blistering heat. The rest is silence, desolation. farther on, where the river curves like an outflung arm and the sampans lie at anchor, you can see the silent shell of Angus, with its open doors and windows. And you know then why it wouldn't be worth his while. You know why it wouldn't be worth anyone's. The Burra Club has announced that this will be the last week of its tours. Thurs., May 2, 10;30 a.m., Kali Temple Tour with a visit to the Burning Ghats. At 8:30 p.m. the Burra Cabana Dinner-Dance. dates only. Fri., May 3, 3:00 p.m., Marble Palace Tour and the Parsee Tower. Sat., May 4, 10:30 a.m., Government House Tour. Remember the crafts room is open. You can still dine out at the Burra Club restaurant.